Throwing a party? Use some of these adorable honeycomb pom poms, easy to made with crepe or tissue paper for a fun decor, perfect for any party! Aren’t these honeycomb pom poms so adorable? I think they’re irresistible and super fun! 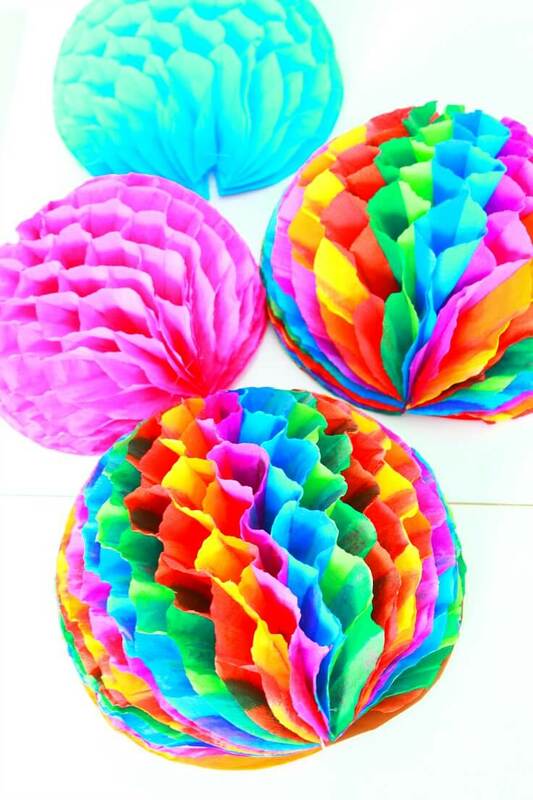 These honeycomb decorations would look great at any party, from kids’ birthdays to weddings or New Years. 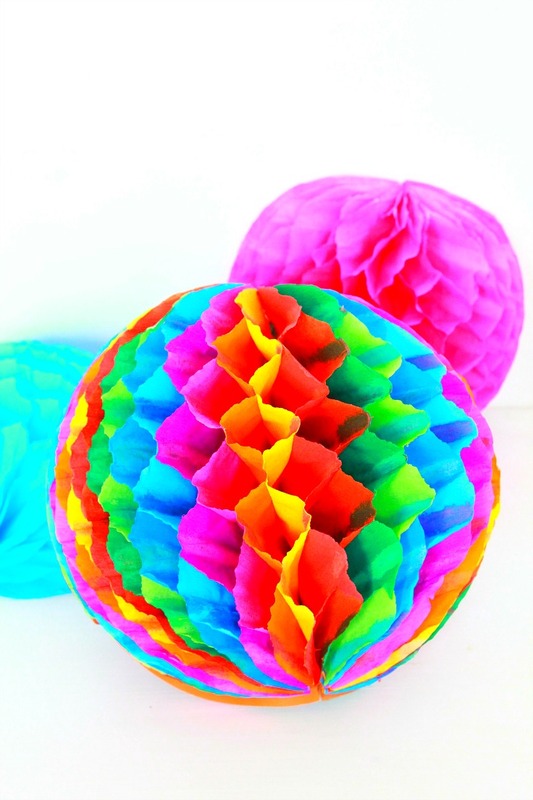 Imagine these cute crepe paper pom poms floating around your house or even your garden; that would be super cool! I love how versatile these honeycomb pom poms are; you can make them in all kinds of shapes and use different colors or even mix up colors as I did. 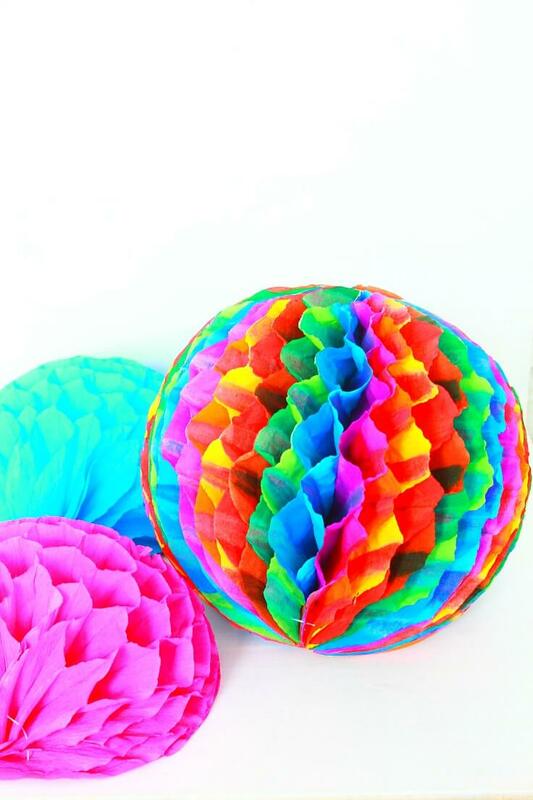 And they’re not great for parties only, these honeycomb paper balls would look amazing as a wall decor too! So feel free to get as creative as you like! Although these gorgeous honeycomb pom poms are a bit time consuming and require some patience and pretty good motor skills, making them is really not rocket science and are quite an enjoyable experience. And the end result is so worth the effort! Plus you get to save some money if you make your own. So here’s how to craft up some pom poms; they’re sure to put you in a great mood! 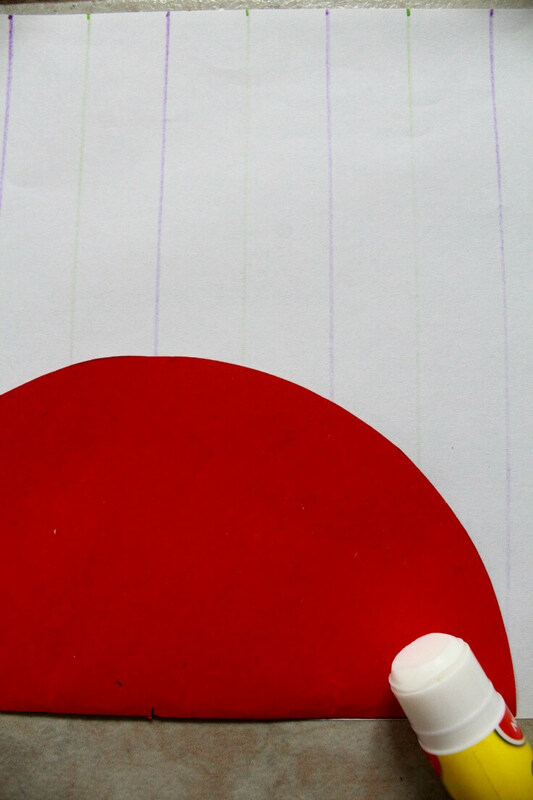 Decide how large your pom poms will be and trace a circle for that size with your compass, on the cardboard. 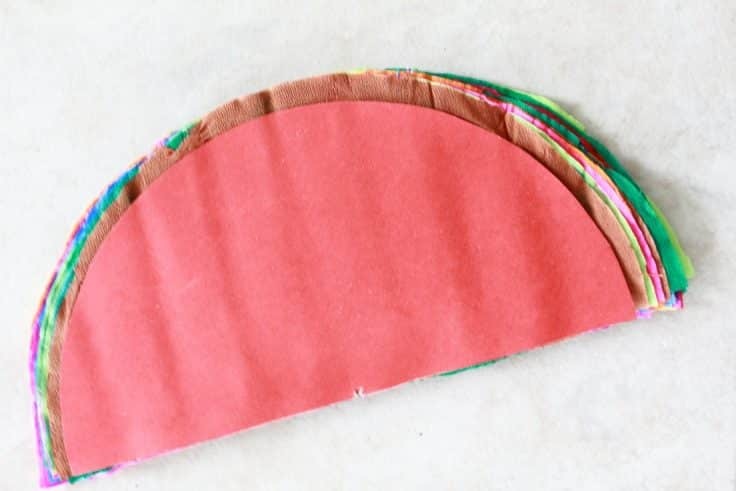 Cut out then fold the circle in half and cut on the fold. 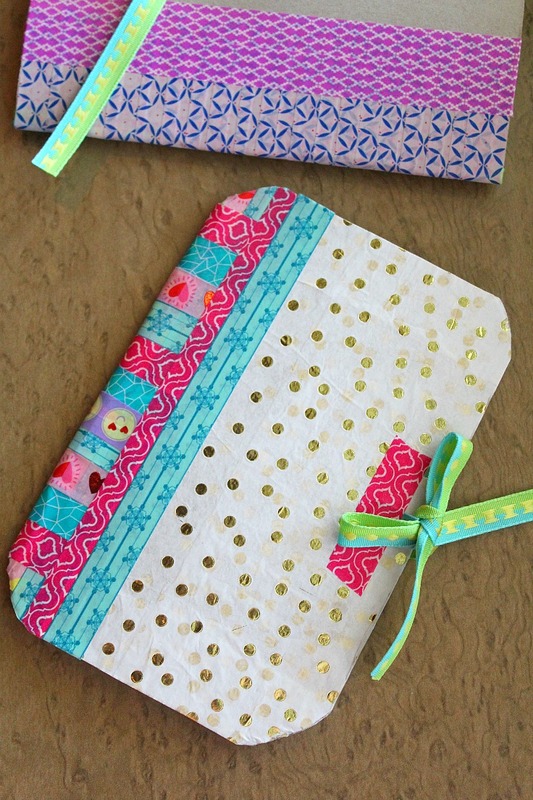 Take the tissue paper and cut according to these halves. If you don’t want your cardboard to peak out, cut the tissue paper slightly larger than the cardboard. You’ll need about 50-60 layers of tissue paper per pom pom, depending on how dense you want your pom pom to be. Take the piece of paper and trace some lines in 1″ increments, in alternating colors. You can increase or decrease the distance between the lines, how close the lines are to each other determines the cell size of the honeycomb. 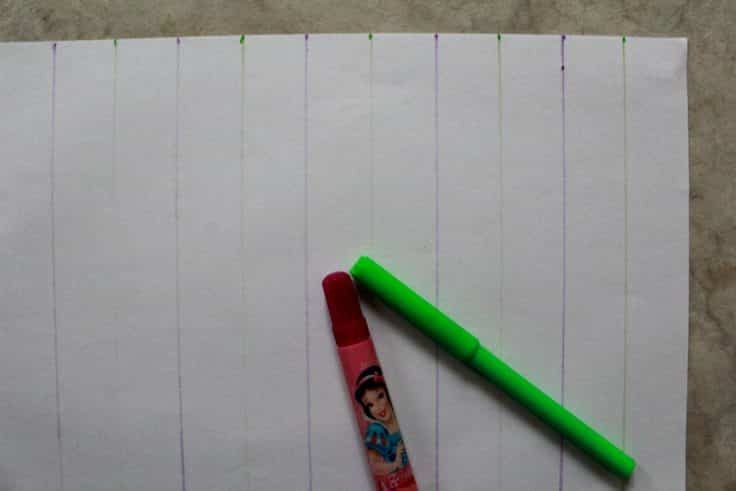 Continue the above step for the first tissue paper sheet, but use the other lines as your guide. Keep alternating guide colors with each layer and end with the second cardboard piece. I didn’t do it on my pom poms but I think it would help them stay in place if you secure the straight edge with clear tape. The pom poms might also look more aligned than mine. Leave to completely dry (I left mine overnight) then trim the edges if the layers are not even. Put a threaded needle through the corner of your pom pom. Knot the thread but keep some loose, otherwise it won’t open. 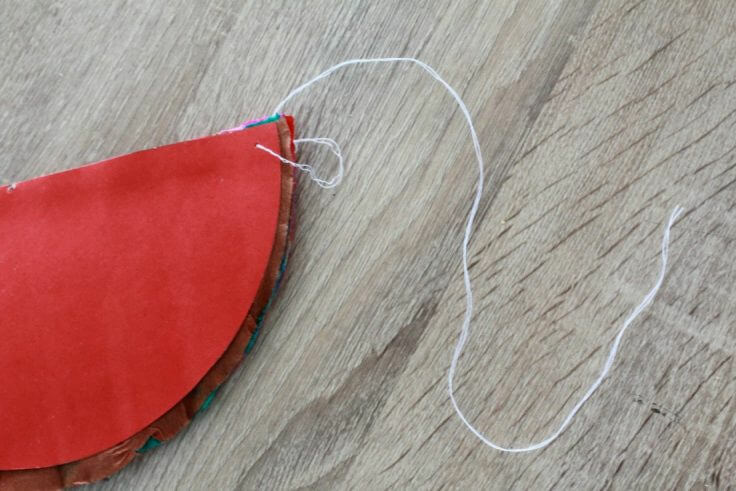 Do the same on the other corner and leave the thread long on one end if you want to hang up the pom-pom later. Hold the cardboard on both ends and pull apart slowly. If some parts are stuck together just keep pulling gently and they should all separate cleanly. 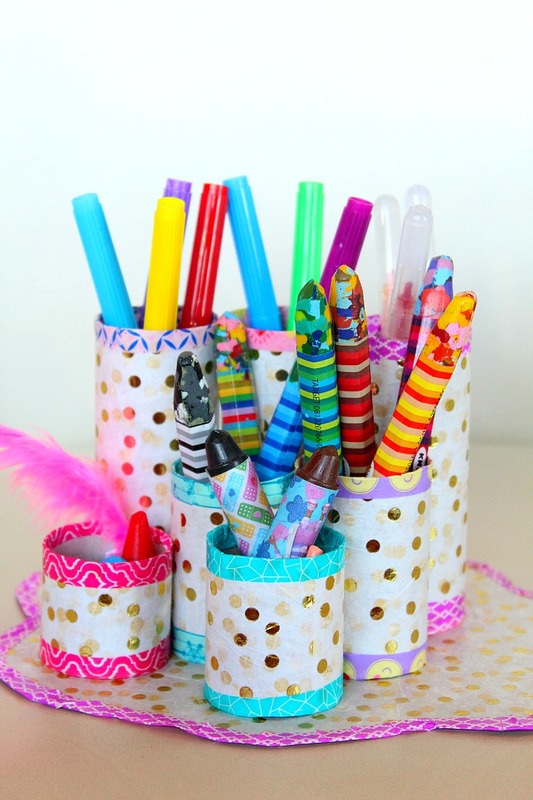 Glue the cardboard pieces together to close the pom pom or use looped tape if you want to store them flat later. And you’re done! 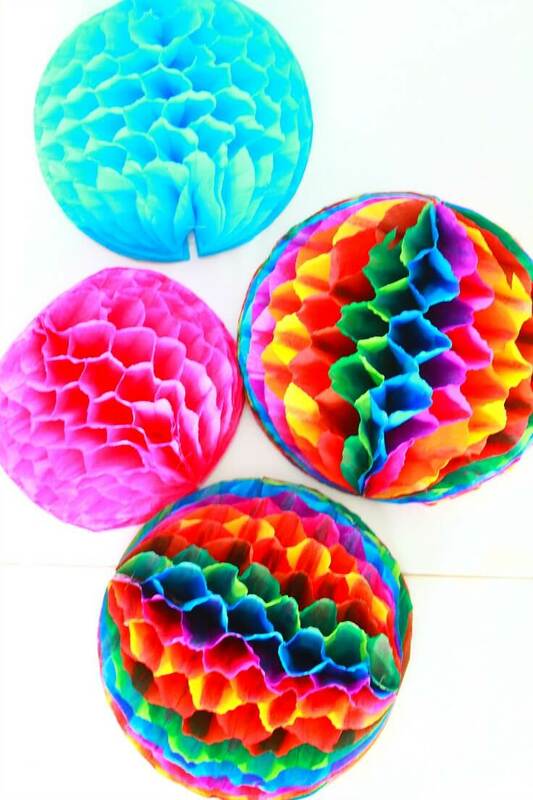 Now go fill your house with all these pretty DIY honeycomb pom poms!